"We have all tried several of the dishes at home on our return to the US and have gotten raves! You both made it so enjoyable with your stories, warmth and humor. We will be back!" Where Is Umbria and What Will You Find if You Visit? The “Green Heart of Italy” neighbors Tuscany in Central Italy. Perugia, the Umbria Region’s walled capital city, as well as the towns of Assisi and Spoleto, are culturally and historically rich, studded with impressive architectural sites such as castles, fortresses and watchtowers. Fontanabella, where Tita’s ancestral home stands on a hillside studded with olive trees, is located off the beaten track five miles from the center of Perugia. It is also near Lake Trasimeno, Italy’s fourth largest lake. Fontanabella, meaning “Beautiful Fountain,” is surrounded by hills called Monte Malbe, meaning “Bad Drinking.” Those names refer to a time long past when drinking water was not to be found in those hills--until some folks came upon the fountains. Despite the story of Monte Malbe, Umbria has been known to be blessed with fertile fields, vineyards, orchards, forests and hills teeming with grains, herbs, vegetables, fruits, dairy and meat animals, and fish since the most ancient days of its history. It is a land studded with rivers, lakes and streams, a place where the shadows of mountains keep the lands from becoming parched in the summer months. The dishes traditional to the simple and delectable Umbrian palate reflect such bounty. The oils and wines pressed from the fruit of local olive trees and grape vines are among the best in the entire world. Varieties of fish and wild mushrooms are plentiful. Beef from local herds is known for its flavor and tenderness, and pork products ranging from lean ham to fresh and dried sausages are known to be exceptional. 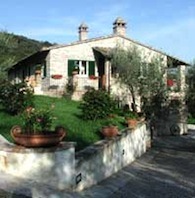 Umbria is a region where the cuisine is integral to the daily life of its inhabitants. It is the heritage to which Tita was born.